BAD LIEUTENANT - NEVER CRY ANOTHER TEAR (CD) | Online Shop | Wizard LTD. 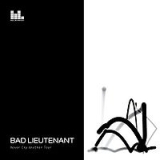 Album: "NEVER CRY ANOTHER TEAR (CD)"
Bad Lieutenant formed in 2007 with New Order&apos;s Bernard Sumner (guitar and vocals) alongside Phil Cunningham (guitar) and Jake Evans (guitar and vocals). The album features sounds that have helped make New Order such a treasured, innovative force over the past three decades, but also featured is a brand new voice from exotic Macclesfield, Jake Evans. The new album centre&apos;s around crisp, streamlined, 21st century guitar music - underscored by keyboards and occasional melodica. The record includes Sumner&apos;s seemingly effortless melodic invention, but now these familiar joys blend with vocals and the talented guitar work of Jake Evans. "This album is very important to me," says Bernard. "We&apos;ve worked hard on it and I&apos;m proud of it. It&apos;s also important because it gives people the chance to hear a gifted new singer and guitar player who I think is really talented." Together, the band have spent over a year writing, recording and mixing the album near Manchester, which features additional musicians including Alex James (Blur) and Stephen Morris (New Order and Joy Division) on several recordings.